With the casino industry rapidly changing, using money and ticket counters is a great way to keep business running smoothly. Customers could win or lose a lot on any given night, and it's essential that when it's the former, the cash desk is ready to give out winnings quickly and efficiently. 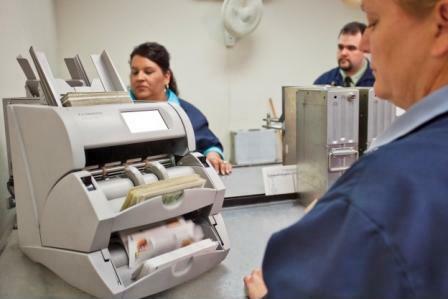 Utilizing these machines helps achieve this goal through the use of ticket-in, ticket-out technology, which reads tickets and sorts cash quickly and effectively. In this way, gaming resorts can place a greater emphasis on customer service, which enables them to retain patrons year after year. One of the more interesting competitions in the casino industry occurs in Connecticut between two of the largest casinos in the world, Foxwoods Resort Casino and Mohegan Sun. Friction exists between the two Native American tribes running the gaming centers, the Mashantucket Pequots and the Mohegans. The tribes are adversaries whose rivalry dates back to the Pequot War and the Mystic massacre in the 17th century. Their opposition is now based on business, with competing casinos facing each other. The Great Recession weakened the tension significantly because both casinos suffered significant losses that they're still recovering from. In an effort to combat this amid increased competition due to gambling legalization in neighboring Massachusetts, the two tribes did the unthinkable and agreed to an alliance recently. The Mashantucket Pequots and Mohegans agreed to jointly develop and operate a new casino in Connecticut, the third in the state. This smaller satellite gaming center would cost $300 million and should feature 2,000 slot machines and 150 table games. Casino blog Calvin Ayre reported a study found the new center would generate $78 million in taxes for the state annually, along with creating 6,000 jobs. The effort would hopefully allow the two tribes to function on an even footing with private companies operating elsewhere. The tribes' full plans will likely surface in 2016. In building this casino, the tribes can stand to benefit from any technology that will help them improve profit margins. Money and ticket counters can help in this manner. By reducing overhead through efficient ticket counting and money sorting operations, gaming centers save money in labor costs, which can go back into casino operations.